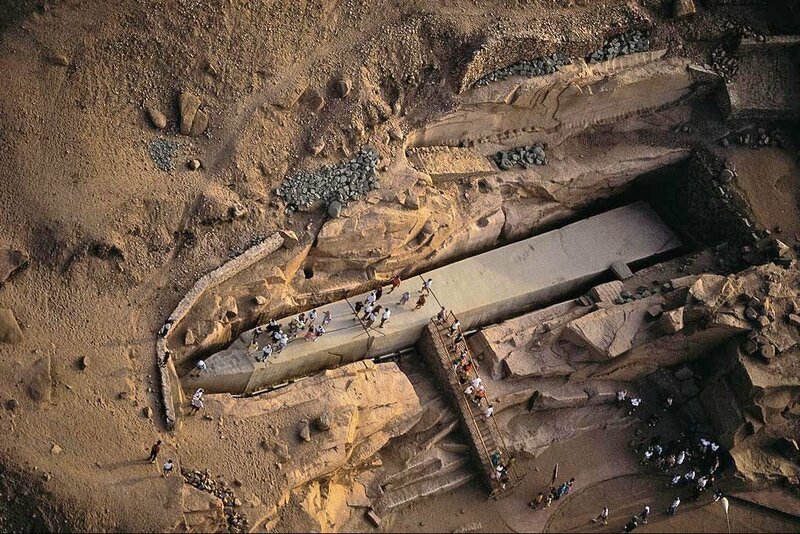 The unfinished obelisk lies in its original location in a quarry of granite in Aswan. It is 42 m. in height. Most probably it was abandoned in its place after discovering some cracks in the rock. 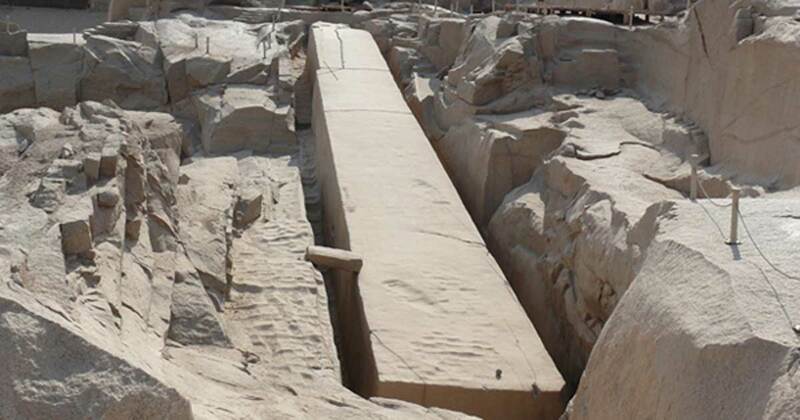 If this one was to be complete it would have been the heaviest obelisk ever been cut in Ancient Egypt, the obelisk alone wait 1100 tons. We think that it belongs to the queen Hatshebsut (dynasty XVIII). The obelisk was a sacred symbol of the cult of the sun. In the early ages, the Ancient Egyptian knew the so called Pn-pn” which was a pyramidal stone with a pointed top. And according to their beliefs the “Pn-pn” symbolized to the primeval hill from which the World appeared. Then in course of time this Pn-pn was evolved to be a obelisk usually made of granite with a pyramidal shape on top. During the 5th dynasty the obelisk began to play an important role inside the temples of Re. It was erected on a great base in an open court then when the sun rays were fallen on its pyramidal top; the bright light filled the place to give the prayer a great emotion of the power of the sun. One of the most important obelisks which still stands in pride at the district of El Mataraya, is the one which was erected in front of the entrance of the vanished temple of Re at Heliopolis. It was dedicated to the temple by king Senwsert I to commemorate the ceremony of the (Heb-sed). In the New Kingdom, especially at the time of the XVIII and XIX dynasties the kings used to erect obelisks in front of the different temple for religious and political reasons.